Vincent Hocquet, founder of Beautiful Freak/The Fisher King, tattoo artist, collector of stereoscopes and viewmasters, digital artist, allround creative spirit, curator of museum “‘t Krekelhof”, restorer of old photographs, designer of phenakistiscopes, and organiser of “"The museumsessions"
Tattooing since 1996, working both at his tattooshop Beautiful Freak and guestspotting in renowned shops and tattooconventions all around the world, Vincent grew into a specialist of big and bold dotwork tattoos, combining patterns, sacred geometry, op-art and ornamental graphism.His work has been published internationally in books and magazines. For his artwork Vincent digitally manipulates photographs, handdrawn mandalas, custom geometric patterns,organic structures and colourschemes into freaky optical illusions. All artworks printed on aluminium are availlable at the fisherking store. He also does artwork on commision. Part of his movie-related artwork can be seen on the permanent expo “Point of view” at the cinema billiards in Koksijde. 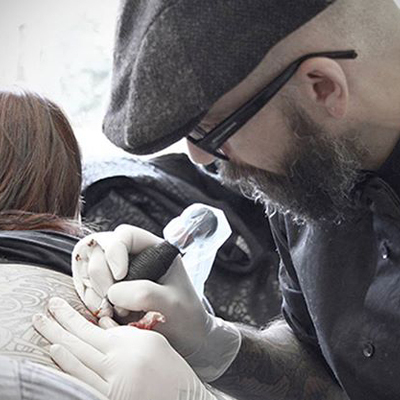 Vincent was involved in several projects outside of tattooing. Early 2000’s Vincent was co-organiser of “het klein verzet” organising 3monthly rock-shows. In 2008 Vincent joined the rehearsals of the grunge-rock band “Just as june” for a collaboration resulting in “the drawing sessions”. Vincent worked on the movies “Exdrummer” and “Tango Libre”, and the shortfilm “27”. He was the organiser of the charity event “What if your world got rocked, combining an art exhibit and auction, and a music festival for the benefit of the victims of the 2010 earthquake in Haïti. In 2012 Vincent was asked to be the main artist of the artsfestival “Lo10”. In 2014 Vincent found the Beautiful Freak-shop became to small for his crazy ideas and decided to look for a more appropriate location. He found an abandoned museum of curiosities and old trades “‘t Krekelhof” and made a proposal to the owners to revive the museum, making an overlapping concept of tattoo's, mixed arts, museum, art gallery, and monthly musical and cultural events and thus became the curator of the museum.Planning, rebuilding and remodelling took a year of work and in november 2015 Beautiful Freak moved into this amazing building. In 2017 Vincent decided it was time to close the 20 year-chapter of “Beautiful Freak” and start a new one by the name of “The Fisher King”.